Melbourne-based artist Robert Owen has been exhibiting as an artist for over fifty years. Moving between painting, drawing, sculpture and installation, his practice has been characterised by his mellifluous explorations into light, colour, space and material. At the core of Owen’s practice is his long engagement with colour marked by two significant events: in 1964 when the artist encountered Giotto’s Scrovegni chapel in Padua, and in 1966 when Owen witnessed an eclipse of the sun over the Peloponnese whilst living on the Greek island of Hydra. These two experiences were formative for Owens ideas on space and light and have resulted in his perennial research graphing his own phenomenology of emotional resonances and mastering the dexterity of colour. Afterglow continues Owen’s investigations of space and light through pure forms of abstract colour. The exhibition combines architectural surfaces, geometry and paint to create an immersive experience that aims to heighten the viewer’s emotional reactions through colour. As three-dimensional paintings, the viewer can walk through and around the work, enveloped by the vibrations and glow of the paint. For Owen, these ephemeral wall works are about levels of feelings and orders of sensation that pulsate from the walls like sound waves or musical nuances. He speaks lyrically about the profusion of colours and sees the shifts between pigments in terms of harmonics, pitches and chords. It is an artistic device that Owen has articulated in his two recent series, Music for the Eyes (2006) and Soundings (2012) and stems from his experiences growing up with jazz in the 1950s. 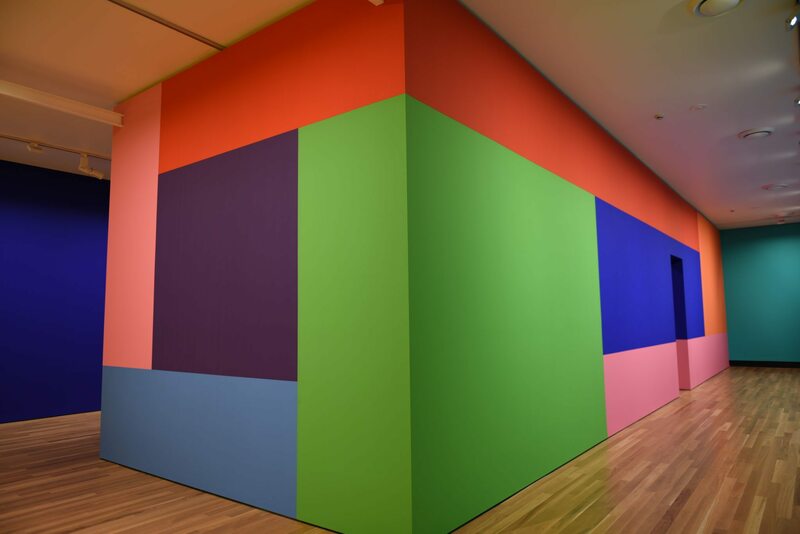 The sixteen colours that canvas the walls, seven of which emanate from Owen’s Origami series (1990), saturate the viewer with an optical aura, causing a visual afterglow of complimentary colours. It is this temporal change in perception that the title of the exhibition takes it name, referencing memory and the impact of colour on our consciousness. 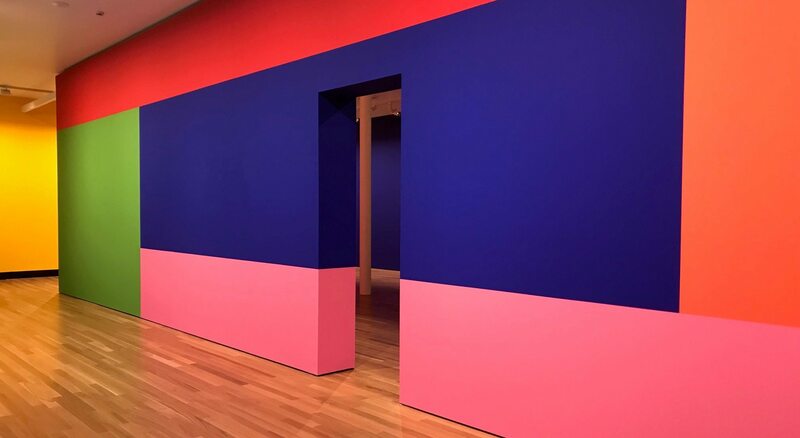 Using the architecture as sculptural form, Owen painted around the edge of the walls, so that the walls could be experienced as a material, like blocks of colour. 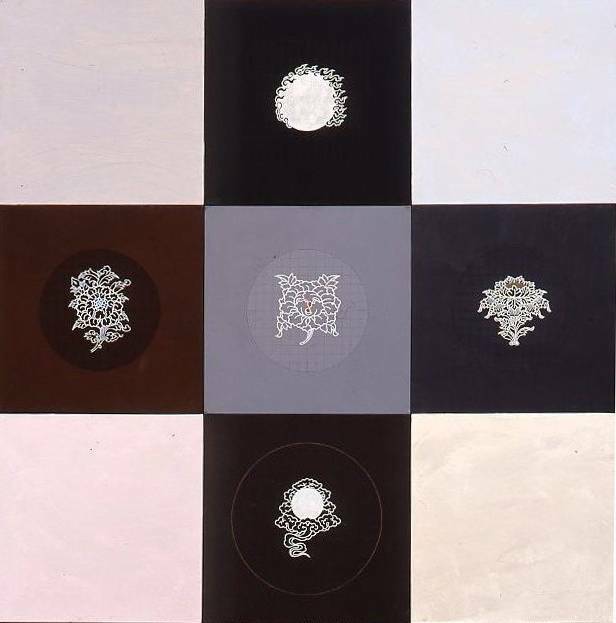 The six inner walls follow a carefully constructed and choreographed rhythm of arrangement, developed out of the same geometric constructions of Owen’s Iris series of painting (1993), with each of these grids divided into five parts. At the center of each composition is a large square of colour, which acts as a portal, like a spiritual threshold, as Owen calls it. Drawing from decades of research, Owen intuitively combines fields of blues, yellows, purples and greens to produce levels of sensations to that which may be experienced in nature. Yet, despite inspired by his own memories of Greek sunrises and inland Wagga Wagga skies, Owen invites viewers to make their own associations to nature, with each wall and passage an open-encounter that remains in constant flux. Afterglow will highlight The speechless full moon comes out now (for Akio), part of The CBUS Collection of Australian Art.